An X-Ray uses electromagnetic beams to produce images of tissue, bone, and organs. These images are produced when varying amounts of the X-Ray beam pass through the body. Soft tissue allows the most to pass through, and these appear gray. Bones, which are much more dense, allow very little of these beams to pass through and will appear white. If there is a break in the bone, the x-ray beam will pass through the broken area and will appear as a dark line. 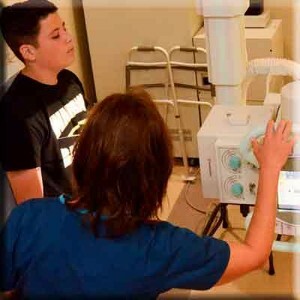 • You will be positioned on an x-ray table. • The parts of the body not being imaged may be shielded with a lead apron to avoid unnecessary exposure. • The X-Ray is taken. It is important to remain still during this procedure, as motion can interfere with the quality of the pictures. • You may be asked to change positions to obtain views at different angles. • The procedure lasts approximately 15 to 45 minutes.